Iredell Express, 26 August 1859. In the old times and old Country. 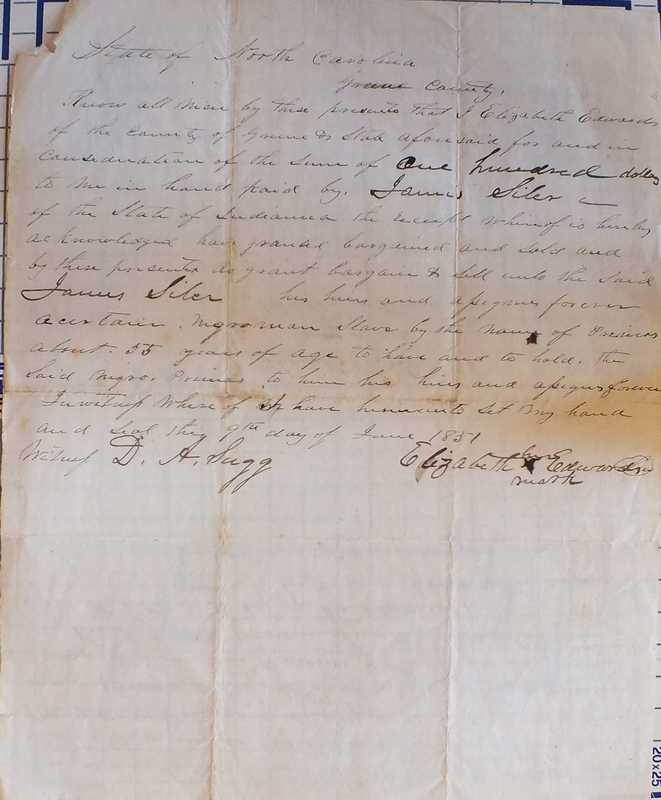 From the file in the Pension Application of Shepherd Tyler, deceased (by his father Primus Tyler), #171234, National Archives and Records Administration. In the 1850 census of Greene County, North Carolina: Elizabeth Tyler, 40, with children Shepherd, 11, Sally, 1, and Nancy, 5. In the 1850 census of District 85, Parke County, Indiana: Reuben Lawhorn, 36, Eiza, 25, Oliver, 5, Alice, 2, George, 9 months, all born in North Carolina; plus George, 24, Nancy, 20, Hymerick, 18, Elizabeth, 17, Primus, 16, Avy, 14, and Moses Tyler, 13, all born in North Carolina. … And the bills to enable Daniel Skeene to emancipate his wife and daughter, and to emancipate Lewis Williams, and James G. Hostler, were each read a third time and passed. The North-Carolinian (Fayetteville), 23 December 1848. To come back to North Carolina and be a slave again. We find in the Kinston Advocate, the annexed letter from a colored man formerly a slave in Wayne County, but who was emancipated some years since by the Legislature, and went to the Northern land of promise where negroes are as good as white people, and every body loved them so much – out of their sight. Mr W.T. Doch sir I writ to you to let you no that I am well hoping these few lines may find you the same. I have written to you because I no you are a man I can depend on. I want to no if I pertition to come back to N.C. and be a slave again if you are a member elected this year if you will advocate it the general assembly & if you will be after gitting the consent of wayn county of her leading men you will please to writ to me & let me no what the prospect would be. Your obedient servant, D.B. Williams. Wilmington Journal, 27 September 1860. By her tender years incapable. The petition of John Monroe, Zebulon Hunt, Alexander B. Caldcleugh, and James Sawyer Executors of the last Will and Testament of Andrew Caldcleugh late of the County of Rowan dec: respectfully sheweth That their Testator on the 11th of february 1822 made and published his last Will and Testament in writing, in which among other things, he devised as follows — That his woman Slave Fanny Kelly should be emancipated for meritorious serviced, rendered to him and his wife, during their sickness, their Testator further devised that the daughter of the said woman Fanny Kelly, called and known by the name of Sally Zimmerman a child of tender Years, should be also emancipated. The said Testator in and by his last Will made ample provisions for the maintenance and support of the said Fanny and Sally as will be seen by reference to his Will. For the purpose of carrying their Testators Will into effect, Your petitioners applied to the Superior Court of law held for Rowan County at October term 1822, and were permitted by the Judgment of the said Court to emancipate the said woman Fanny Kelly, which they have done in conformity with law. But the said Court having power only to allow emancipation of Slaves for meritorious services rendered to their Owners, and the said Sally from her tender Years, being incapable of rendering such services as are contemplated by the act of Assembly Your petitioners are unable to affect the emancipation of the said Child Sally by the Judgment of said Court. Your petitioners further state, that no other person then Your petitioner Alexander R. Caldcleugh has any interest in retaining the said Girl Sally in a state of Slavery, he being the only child and heir at law, as well as resduary legatee of the said Andrew Caldcleugh. General Assembly Session Records, Box 1 (November 1832-January 1924), Folder November 29, North Carolina State Archives. He has never been accused of any villainy. The Petition of the Several Subscribers Humbly Sheweth That whereas Samuel Smith a few Years ago Manumitted a Servant Man Named Peter (Whose Mother was an Indian & Father a Negroe) which said Servant Man hath not been taken up nor Sold by the Court; And as he hath hitherto Always been an Orderly Servant & never that we know of bein Accused of any Villany, But on the Contrary Hath done Several Meritorious Actions in Destroying Vermin Such as Bears Wolves wild Cats & Foxes. Therefore we pray that the Court may take it into Consideration & order & adjuge that he may remain Free & unmolested as long as he behaves himself well. And your Petitioner the Several Subscribers, as in Duty Bound shall ever Pray. April 6th 1782.